Real wood shelving is an attractive kitchen accessory, which cannot be surpassed by veneered alternatives. Our collection of oak kitchen shelves are hard-wearing, robust and naturally appealing, and help to keep countertops free of clutter, too. Crafted in our home county of Gloucestershire, these oak wall shelves are made from a number of solid wood staves, each measuring 40mm wide. The staves are finger-jointed and glued under high pressure to achieve a strong bond. Each shelf is then sanded to a 150 grit smoothness and nourished with three coats of Danish oil to protect the wood and enhance the attractive look of the grain. 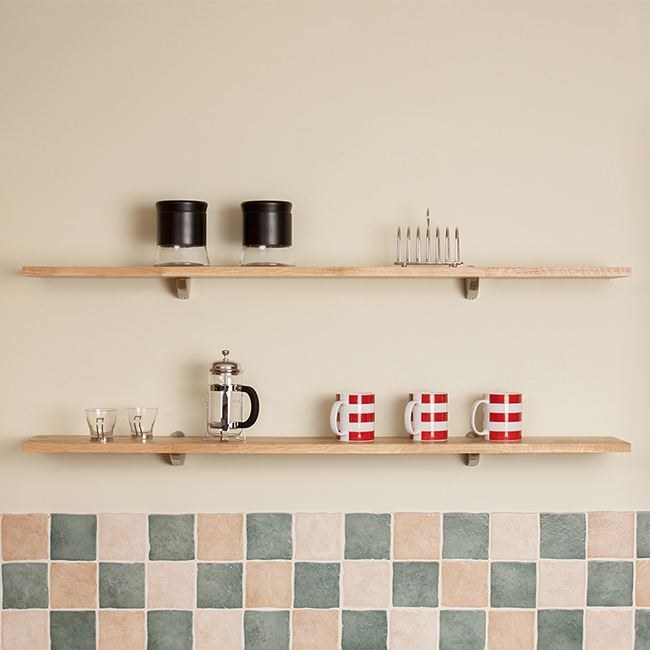 Noted for its strength as well as its traditional charm, Oak is an ideal choice of timber for kitchen wall shelves. These shelves are available in a variety of sizes, allowing our customers to find the perfect size to suit their kitchen. These shelves are available in an 18mm or 27mm thickness, and in a range of lengths, from a minimalist 300mm to an impressive 1500mm. Please note that brackets are sold separately.